This document contains information on the DUNES archive in addition, and complementary to what is provided in the paper entitled "DUst around NEarby Stars. The survey observational results" (Eiroa et al. (2013)). In what follows, the contents of the several parts of the archive are described. The prime identifier used by DUNES is the Hipparcos (HIP) number. When available,the HD (Henry Draper), HR (Harvard Revised)/BS (Bright Star) and other denomination of the type, e.g. 24 Cas, η Cas, EP Eri, are given. The equatorial (IRCS, right ascension and declination), galactic (longitude and latitude), and ecliptic (longitude and latitude) coordinates are provided. All data are referred to the J2000.0 equinox and epoch (proper motions have been taken into account). Stellar parallaxes and proper motions and errors are from the revision of the Hipparcos catalogue by van Leeuwen (2007), Vizier catalogue I/311. References for the remaining stellar parameters, namely, spectral type, effective temperature, gravity, metallicity, projected rotational velocity, bolometric luminosity and age can be found in Eiroa et al. (2013). Several magnitudes and colour indices have been used to build the spectral energy distribution (SED) for each star. Each item below describes the source of the data and gives the corresponding reference for the zero points (fluxes at zero magnitude) that have been used to compute the fluxes included in the files hipxxxxxx_sed.dat that can be found by clicking the option Full SED. 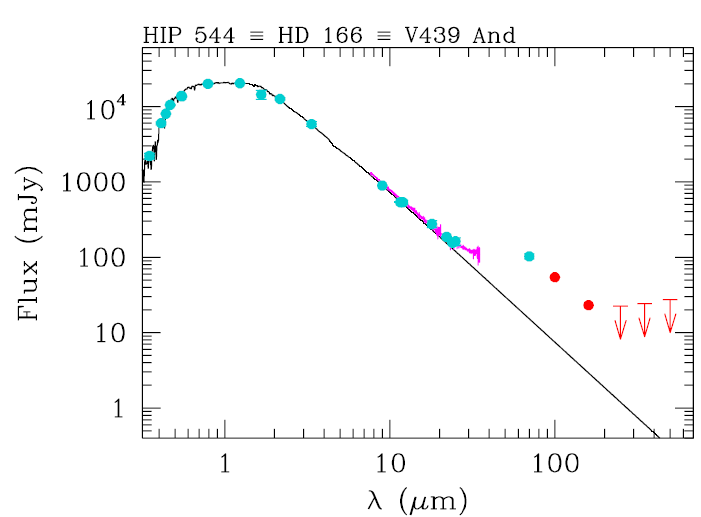 Johnson BV and Cousins I magnitudes from the Hipparcos catalogue (I/239 in Vizier). The calibration from magnitudes to fluxes is carried out using the zero points by Bessell (1979). Strömgren b-y , m1 and c1 is taken from Hauck & Mermilliod (1997), Vizier catalogue II/215 (see also Hauck & Mermilliod, 1998). These indices were converted into uvby magnitudes, and then into fluxes using the zero	points by Gray (1998). 2MASS JHKs are from the 2MASS Point Source Catalogue (II/246 in Vizier). Zero points for calibration from magnitudes to fluxes are from Cohen, Wheaton & Megeath (2003). Additional near-infrared JHKLL'M photometry was collected from several sources. See Table 3b of Eiroa et al. (2013) for details and references. Averages of the available data for each band were used. Zero points for calibration were taken from Table 7.5 (p. 150) of "Allen's Astrophysical Quantities (4th edition)". IRAS 12, 25 and 60 µm fluxes (in Jy) and errors (percentage of the observed flux) are from the IRAS Faint Source Catalogue ( II/156a in Vizier), when available, or from the IRAS catalogue of Point Sources (II/125 in Vizier). Upper limits are not listed. Non-colour corrected fluxes are provided when clicking this option of the archive (see below the description of the files containing the SEDs for details on the colour corrections). Akari 9 and 18 µm fluxes and uncertainties (in Jy) are from the AKARI/IRC mid-IR all-sky Survey (ISAS/JAXA, 2010, II/297 in Vizier). Non-colour corrected fluxes are provided when clicking this option of the archive (see the description of the files containing the SEDs for details on the colour corrections). WISE 3.4 (W1), 11.6 (W3) and 22.1 (W4) µm magnitudes and errors were extracted from the WISE All-Sky data Release Catalogue (II/311 in Vizier) and converted into fluxes using the zero points for calibration from Wright et al. (2010). Fluxes and uncertainties are provided in Jy. Data from band W2 (4.6 µm) were not used and are not provided; a systematic bad behaviour of the fluxes in this band when compared with the remaining SED fluxes was apparent. Spitzer/MIPS fluxes at 24 and 70 µm are provided. The data analysis of the images to extract these fluxes is similar to that described in Bryden et al. (2009). At 24 µm, images were created from the raw data using software developed by the MIPS instrument team (Gordon et al. 2005), with image flats chosen as a function of scan mirror position to correct for dust spots and with individual frames normalized to remove large scale gradients (Engelbracht et al. 2007). At 70 µm, images were also processed with the MIPS instrument team pipeline, including added corrections for time-dependent transients (Gordon et al. 2007). Aperture photometry was performed as in Beichman et al. (2005) with aperture radii of 15.3 arcsec and 14.8 arcsec, background annuli of 30.6-43.4 arcsec and 39.4-78.8 arcsec, and aperture corrections of 1.15 and 1.79 at 24 and 70 µm, respectively. The 24 µm centroid positions, which are consistent with the telescope pointing accuracy of <1 arcsec (Werner et al. 2004), were used as the target coordinates for both wavelengths. As far as the flux uncertainties is concerned, the DUNES targets are observed at 24 µm with high S/N; the uncertainty at that wavelength being generally dominated by systematics at the level of ∼2% for overall calibration and <1% for repeatability (Engelbracht et al. 2007). The 70 µm uncertainties are calculated from direct measurement of the background variation in each field, using the same apertures and corrections as for the photometry. A calibration uncertainty of 5% and a repeatability uncertainty of 4.5% (Gordon et al. 2007) are also included. PACS (70, 100 and 160 µm) and SPIRE (250, 350 and 500 µm ) fluxes and uncertainties or 3-σ upper limits are provided. Units are mJy. Details on the image reduction, noise analysis and extraction of the photometry can be found in Eiroa et al. (2013). A summary sheet called hipxxxxxx_summary_sheet.pdf contains in a single page all the relevant information for each star. Hereafter, the string xxxxxx in the file names contains the Hipparcos identification of the star padded with zeros to the left when necessary (e.g. hip000910 or hip049908). Identifications, equatorial coordinates, the parallax, proper motions, stellar parameters, plots of the PACS and SPIRE mosaics and the SED, and the PACS and SPIRE fluxes are provided. The first one contains the whole SED including the PACS and SPIRE fluxes; the second one is contains a plot of the full SED. The data are organized in four columns: (1) wavelengths in µm, (2) fluxes and (3) uncertainties in mJy, and (4) descriptions of the bands (and any specific comment). Details on the calibration from magnitudes to fluxes are given above in the paragrpah devoted to the photometry. The Akari fluxes have been colour corrected using the data provided in Section 4.8 of the "Akari IRC Data User Manual. Version 1.4"
(look for the document in section "Instrument Data Users Manuals"). The observed fluxes were divided by the corresponding constants, K(9 µm), K(18 µm). Values in Table 4.8.11 were taken and the effective temperature was used as independent variable. Typical values for the corrections at the temperatures of the DUNES stars are 1.18, 0.99 at 9 and 18 µm, respectively. The IRAS fluxes have been colour corrected dividing the observed fluxes by the corresponding corrections K(12 µm), K(25 µm) and K(60 µm). Their values are estimated by interpolation of the numbers given in the IRAS Explanatory Supplement. VI. Flux Reconstruction and Calibration. Table Suppl. VI.C.6 - Color Correction Factors, K. (see the last table of that web page) using the effective temperature as the independent variable. Typical values of the corrections are 1.43, 1.40 and 1.32 for 12, 25 and 60 µm, respectively. The PACS -and SPIRE, when available- fluxes (or 3-σ upper limits) are given in the last lines of the table. The uncertainties in those fluxes contain only the statistical errors. The photometry from the optical up to Spitzer/MIPS 70 µm is plotted as light-blue solid circles, the PACS and SPIRE fluxes are plotted as red circles; 3-σ upper limits are clearly indicated. The Spitzer/IRS spectra are plotted in magenta. The normalized photospheric model is plotted in black. Each graph shows the fluxes Fν, in mJy, plotted against the wavelength in µm. These plot can be reproduced for a given star using the following set of files that can be found in this archive: Full SED fluxes: hipxxxxxx_sed.dat Spitzer/IRS spectrum: hipxxxxxx_irs_spectrum.dat Model photosphere: hipxxxxxx_model_photosphere.dat Note that SPIRE data and IRS spectra are not available for all the objects. They contain photospheric models normalized to the photometry that has been used to build the SED (see above). Details on the original models and the method used to normalize them to the photometry are given in Eiroa et al. (2013). Several combinations of bands (BVI+ 2MASS JHKs + auxiliar JHKLM + WISE) were used to carry out normalizations of the original model; the one with the least reduced χ2 was chosen. Only 2MASS photometry with quality A or B was used, and special care was taken not to include the WISE W4 band when the star showed an infrared excess starting at wavelengths around ∼20 µm. The Spitzer/IRS (Houck et al. 2004) spectra provided in the archive are a combination of all low-resolution modules available from the Spitzer archive. For each module, data are taken with the star positioned at two locations along the slit, to allow for background subtraction. The resulting spectra are averages from the two slit positions, while the uncertainty at each wavelength is estimated from their difference. The slit for the long-wavelength mode (LL2: 14-21 µm and LL1: 20-40 µm) is much wider (11 arcsec) than the telescope pointing uncertainty (1 arcsec; Werner et al. 2004), such that flux loss outside of the slit is minimal and no scaling of individual modules is needed. The shorter wavelength modules (SL2: 5-8 µm and SL1: 8-14 µm), however, can suffer from slit loss and need to be normalized to match the longer wavelength spectra; the adjustement in flux is typically between 0 and 10% (see e.g. Lawler et al. 2009, who found a dispersion of 8% when they normalized short-wavelength data to an independent model photosphere). and the data are organized in three columns: (1) wavelengths in µm, (2) fluxes and (3) uncertainties in Jy. Note: All IRS the spectra but two were built by members of the DUNES team. The origin of the spectra for HIP 7978 and HIP 17439 can be found in the corresponding headers of the files; the original format of the data they contain has been kept unchanged in the archive. where again lambda indicates the corresponding wavelength. but the corresponing files are identical. The coordinates of each target must be explored in order to extract the right photometry. were taken in point source photometry (chop-nod) mode. HIP 113357 (51 Peg) was only observed by the survey in chop-nod mode and thus that observation must suffice for analysis of that target. HIP 7978 (ql Eri) was later observed in scan map mode by the calibration team with the 100/160 combination using non-standard map parameters (OBS_IDs 1342187138,-39) and by the DUNES survey with the 70/160 combination using the standard parameters as per the bulk of the survey (OBS_IDs 1342212838,-39). Due to the scan map having a lower measured rms sky noise levels and a better characterized observing mode, we recommend the utilisation of the scan map data over the chop-nod data for analysis and interpretation of this target. This document was prepared by Benjamín Montesinos on behalf of the DUNES consortium.